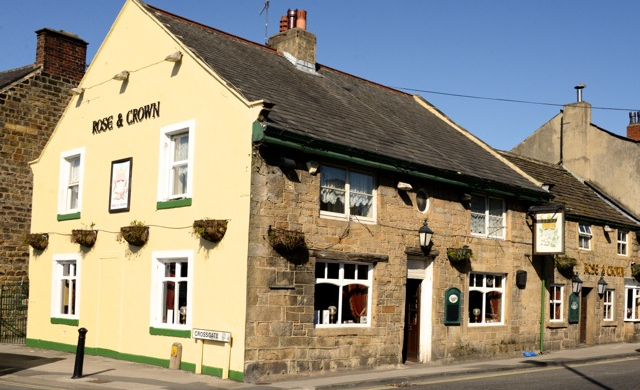 The Rose & Crown was built in 1731 and its age is evidenced by the thickness of the walls and the older stonework to the rear. The first known licensee was J. Sharphouse in 1821. Mr. Edward Mawson took over in 1865. In 1873, a haystack belonging to Mr. Edward Mawson of the Rose and Crown Inn, was discovered to be on fire. The Fire Brigade were soon called to the spot and after a short time the fire was extinguished but not before it had done damage to the value of £60. The fire was supposedly to have been started by some children playing nearby who had some matches. He was followed by John William Holmes in 1882, Thomas Murgatroyd in 1888, Hannah Thomason (1895) and Joe Westmoreland in 1899. The turn of the century saw Leonard Naylor as licensee (1901-04), John Bagshaw succeeding him in 1904, and Samuel Atkinson in 1906. Mr. John Dawson was the next tenant in 1914 until his death when the licence was transferred to Mrs. Amy Dawson. The pub had many more licensees over the following years, and in 1974, three years after Mr. Dan Donovan became licensee, he had two problems. One of them was the origin and purpose of an iron cross. A former licensee’s wife had told him that there was a Corn Cross on the premises and, after making enquiries, he learned that it was on a wall in the yard which was overgrown with ivy. When he tore down the ivy, he found the cross let into the wall but nobody knew anything about it. He said it must have a story. Whatever it was, it had been put there deliberately. The iron cross was 2 feet long and the arms just under six inches across. Mr. Donovan’s second problem hung over the bar counter. It was a cricket bat – but one that no self-respecting batsman would dare to take to the wicket. It was made of one piece of wood, of extra width, with a painted splice. It was stained and varnished, and on the business side of the blade were painted a white rose and crown. Several names had been scratched on the blade, but these were almost illegible. He was told that the bat had been made by a licensee many years ago for a charity match played at Ilkley and would appreciate more details about that event. Chris White became Landlord in 1991 after having had three pubs in Otley. The first was the New Inn in the Market Place, followed by the Whitakers Arms on Kirkgate and then on to the Rose & Crown. 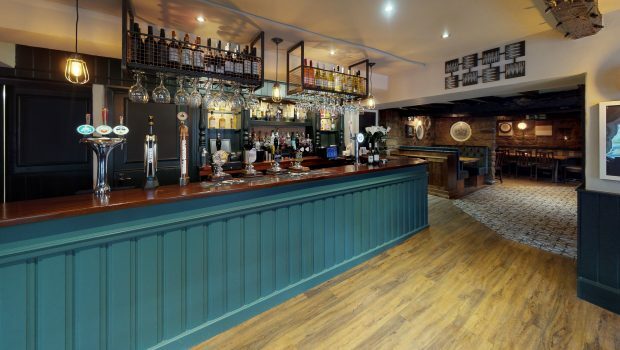 During 1994, the lease of the pub was up for sale as its Whitbread Pub Partnership lease was on the market so Chris White was looking to buy a freehold pub and selling his lease at the Rose and Crown. Mr. Ian Stephens and his wife Sue took over the Rose and Crown in 1994 and in 1996 the pub was refurbished.